This is a blog post I wrote to show my University of Toronto students how to write about a specific story they were to blog about for a class. Instead of just marking them, I provided them with an example of a well-crafted blog post that would have received a perfect mark from me. The actual story being referred to is a year old. Don't pay attention to this article. I'm posting it for my students. The Next Web writer Stefan Meeuws pens a case study of a Twitter marketing campaign focused on hastags gone wrong for American fast food restaurant chain McDonald’s. 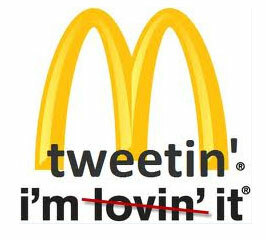 In his article, Meeuws explains that the restaurant’s use of the Twitter hashtag “#McDStories” backfired on the company when tweeps used the hashtag to share negative stories and make uncomplimentary comments about McDonald’s. Meeuws describes how McDonald’s use of the “#MeetTheFarmers” hastag had been more successful for the company, although he fails to mention that the restaurant chain’s social media team quickly switched to the alternate hashtag when the #McDstories ran into trouble. The remainder of Meeuws’s article is focused on what McDonald’s and other companies thinking about investing in a social media campaign on Twitter should have done to avoid having a campaign backfiring. While Meeuws’s three points are insightful, they are not easily implementable, are easy to point out after the fact, and do not always focus on the idiosyncrasies of Twitter for social media marketing. For example, when Meeuws writes that McDonald’s should have focused on its Facebook fans, he ignores the fact that Facebook and Twitter offer different social media exposure and have different designs. McDonald’s was after new customers, not existing ones. Reaching both groups means different campaign objectives, justifying the restaurant chain’s judicious use of Twitter instead of Facebook.